In a little-noticed comment before his controversial July 2018 summit meeting with Russian President Vladimir Putin in Helsinki, U.S. President Donald Trump characterized his government’s multi-hundred billion dollar plans to replace the aging U.S. nuclear arsenal as “a very, very bad policy.” He seemed to express some hope that Russia and the United States, which together possess over 90 percent of the planet’s nuclear warheads, could chart a different path and avert renewed military and nuclear competition. Citing a deteriorating international security environment, the Trump administration is pursuing a significant expansion of the role and capability of the U.S. nuclear arsenal. In addition to continuing full speed ahead with its predecessor’s plans to replace the nuclear triad and its associated warheads on largely a like-for-like basis, the administration is proposing to broaden the circumstances under which the United States would consider the first use of nuclear weapons, develop two new sea-based, lowyield nuclear options, and lay the groundwork to grow the size of the arsenal. At the same time, key U.S.-Russian nuclear arms control agreements, which serve to regulate the nuclear balance and prevent unconstrained nuclear competition, are now in serious doubt. The Trump administration has announced the United States will leave the landmark 1987 Intermediate-Range Nuclear Forces (INF) Treaty in August 2019 unless Russia returns to compliance with the pact, and expressed hostility towards extending the 2010 New Strategic Arms Reduction Treaty (New START). New START expires in 2021 but can be extended by up to five years subject to the agreement of Washington and Moscow. In short, the Trump administration is preparing to compete in a new nuclear arms race while simultaneously increasing the likelihood of such a contest. The projected cost of the proposed nuclear spending spree is staggering and it is growing. The United States currently plans to spend nearly $500 billion, after including the effects of inflation, to maintain and replace its nuclear arsenal over the next decade, according to a January 2019 Congressional Budget Office (CBO) report. This is an increase of nearly $100 billion, or about 23 percent, above the already enormous projected cost as of the end of the Obama administration. Over the next 30 years, the price tag is likely to top $1.5 trillion and could even approach $2 trillion. These big nuclear bills are coming due as the Defense Department is seeking to replace large portions of its conventional forces and internal and external fiscal pressures are likely to limit the growth of—and perhaps reduce—military spending. “We’re going to have enormous pressure on reducing the debt which means that defense spending—I’d like to tell you it’s going to keep going up—[but] I’m not terribly optimistic,” Alan Shaffer, deputy under secretary of defense for acquisition and sustainment, said in February 2019. This report outlines the ways in which the Trump administration’s nuclear strategy is unnecessary, unsustainable, and unsafe. 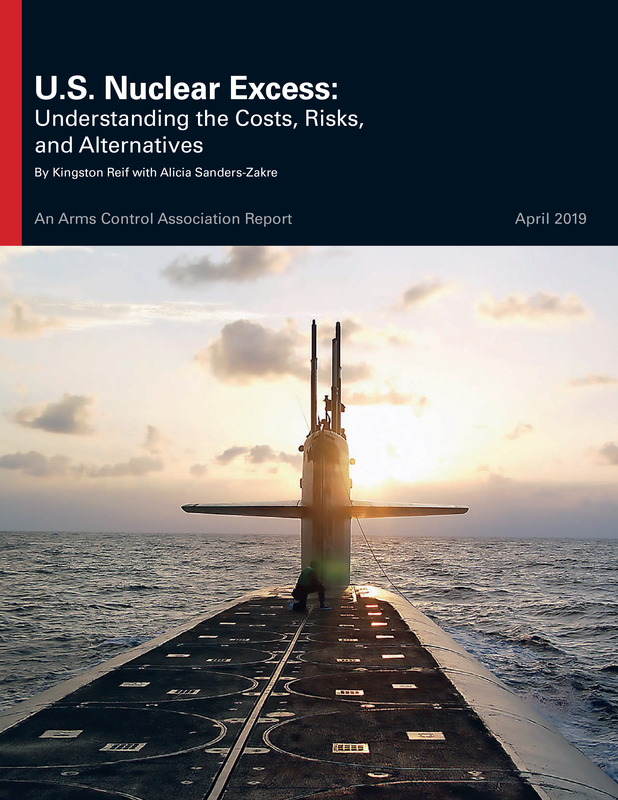 It describes three realistic options to reduce spending on nuclear weapons while still maintaining a devastating nuclear deterrent. Scores of billions of dollars could be saved or redirected to higher priorities by eliminating, delaying, or scaling back the administration’s proposals for new delivery systems, warheads, and infrastructure. The report also recommends key steps Congress can take to enhance affordability and improve its understanding of the underlying policy assumptions and long-term budget challenges. Over the past several years, Congress has largely supported both the Obama and Trump administration’s proposals to replace the arsenal, though not without controversy. That approach can, should, and likely will change. The United States maintains a larger and more diverse nuclear arsenal than is required to deter and respond to a nuclear attack against itself or its allies. Despite claims that nuclear weapons “don’t actually cost that much,” the simple fact is that unless the administration and its successors find a pot of gold at the end of the rainbow, planned spending to maintain and replace the arsenal will pose a significant affordability problem, and threaten other national security priorities. Moreover, the plans would increase the risks of miscalculation, unintended escalation, and accelerated global nuclear competition. Key leaders in Congress are increasingly aware and concerned about the rising price tag, the Trump administration’s controversial proposals for expanded nuclear capabilities, and the risk of a total breakdown of the U.S.-Russian arms control architecture. These and other factors will bring far greater scrutiny to the U.S. nuclear recapitalization programs, their rationale, their cost, and policy alternatives. Now is the time to re-evaluate nuclear weapons spending plans before the largest investments are made. The choice then is between the current strategy, which is excessive and unnecessary, puts the United States on course for a budgetary train wreck, and would increase nuclear risk, or a more realistic and affordable approach that still leaves the United States with a devastating nuclear force that is more than capable of deterring any nuclear threats to the United States and its allies. Given the stakes, the choice should be obvious.